Several weeks back, State/OIG released its inspection report of the US Embassy Hanoi and Consulate General Ho Chi Minh City in Vietnam. 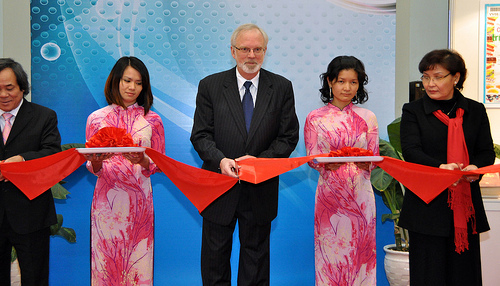 The US Ambassador to Vietnam is career diplomat, David Shear who arrived at post in August 2011. The Consul General at Ho Chi Minh City is An T. Le who arrived at post in August 2010. The Consular Chief in Hanoi is Deborah Fairman who arrived at Embassy Hanoi in August 2009 and became section chief in July 2011, according to the OIG report. The Consular Chief at CG Ho Chi Minh City is not named in the report. The inspection took place in Washington, DC, between September 7 and 27, 2011; in Hanoi, Vietnam, between October 20 and November 2, 2011, and between November 19 and 21, 2011; and in Ho Chi Minh City, Vietnam, between November 2 and 18, 2011. The names of the members of the inspection team have been redacted. The Ambassador in Hanoi, the consul general in Ho Chi Minh City, and their respective deputies, should be at the forefront of an effort to more effectively coordinate embassy and consulate general operations. Increasing and formalizing regular, planned working visits of American and local employees between the two posts are a necessary step. Embassy Hanoi’s reporting is generally comprehensive and of high quality, although staffing gaps and the loss of a position have adversely affected Hanoi’s output. 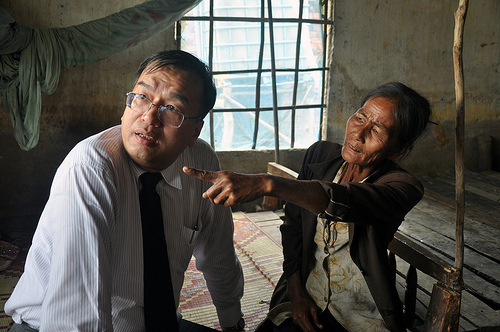 Consulate General Ho Chi Minh City has not reported frequently enough or in sufficient detail on the official activities, meetings and policy views of the consul general. Overall management operations at Embassy Hanoi and Consulate General Ho Chi Minh City are effective, although stronger cooperation and teamwork between the two are necessary. The need for heightened involvement by embassy management in the mission’s management controls program is evident. Management control procedures at both Embassy Hanoi and Consulate General Ho Chi Minh City need to be carefully reviewed to ensure that employees at every level are fully aware of their responsibility for ensuring that controls are in place to protect assets and to avoid any perception of conflict of interest. The Ambassador also has engaged decisively with the embassy’s sole constituent post: the large and influential Consulate General Ho Chi Minh City (formerly Saigon). On his introductory visit to Ho Chi Minh City, the Ambassador stressed to the American and Vietnamese staff that, as Chief of Mission, he values the important role of the consulate general and expects the embassy and consulate general staffs to function as “one mission, one team.” His message was especially welcome in view of a number of legacy issues, including Ho Chi Minh City’s continuing role as the economic and commercial hub of the entire country, the persistent cultural and historical differences between Vietnam’s North and South, and the symbolic significance that today’s consulate general is located on the site of the former embassy. Embassy Hanoi and Consulate General Ho Chi Minh City, until recently, have operated more like two, separate missions than one, cohesive entity. The embassy has not provided, nor has the consulate general sought, regular guidance as to how the two posts can best operate together. With the arrival of new staff in summer 2011, both the embassy and the consulate general have started thinking about ways to project a “one mission, one team” face to the government and people of Vietnam and to the respective mission staffs. A necessary step to improving the mission’s cohesiveness will be increasing and formalizing a process whereby American and local employees conduct working visits between the two posts, for consultations and training. There is no “I” in team, and hey, what about those pol reports? The consul general is fluent in Vietnamese and has a deep understanding of the host country’s culture and norms. However, he only infrequently writes cables regarding his meetings outside the consulate general. It is important that he include other officers in all meetings related to political and economic affairs, human rights, the environment, energy, adoption concerns, treatment of minorities, and other matters relevant to their respective portfolios. The expertise of these officers should be called upon, even if it means relying on interpreters in some situations. (The Vietnamese language is notoriously difficult; even language-qualified officers sometimes require assistance from native speakers in unscripted situations.) The officers could act as note takers, and write cables or provide other information coming out of these meetings. In a closely controlled political environment such as Vietnam, no post official, including the consul general himself, should meet with Vietnamese officials unaccompanied. As an added benefit, in a culture that venerates seniority and status, including officers in meetings would enhance their ability to develop contacts and follow up independently on important issues. The consulate general has produced some valuable and insightful reporting, but generally there is far less reporting than would be expected of a post of its size. Material provided by a consulate general often ends up in cables from the embassy, and there is a vibrant, informal exchange between the respective political and economic sections. More telling, however, is the lack of emphasis upon reporting by the consul general, who does not routinely report on his own activities nor provide comprehensive readouts. For example, a single cable reported on his visits to 6 provinces over the course of 7 months. This disinclination both eliminated a major source of reporting, as compared to previous years, and undercut the ability of other officers to follow up on his meetings. The inspection team counseled the consul general and his deputy to follow standard reporting practices. iPads with no wi-fi, because folks will, of course pay for 4G in Vietnam – wait, what?! For security reasons, there is no wireless Internet access at the embassy’s American Center, which limits the usefulness of the its new iPads. The OIG team discussed this situation with the embassy’s information management (IM) section, but due to the technical complexity of the issues, no decisions had been made by the end of the inspection. It is important that the mission continue to research ways to resolve these issues and still comply with Department regulations in 5 FAM 790-792. VietNamNet has a pretty straightforward explanation – the new iPad has the advantage of having a 4G connection. However, that advantage has no use in Vietnam, where no mobile network has provided 4G services. So if you can’t use the new iPads at the American Center because there is no wireless access and there is no 4G service in Vietnam, the embassy clearly bought itself some pretty expensive mousepads. Visa Referral System for national interests and who else? The consulate general executive office, including both American and local staff, frequently contact the consular section to pass on information about specific visa applicants. For instance, they might ask the section to review a case; tell why they believe an applicant is qualified; or ask the consular chief or another manager to conduct a second interview. These practices violate the Department’s worldwide referral policy, which mandates that no information on specific cases be passed to the section outside of formal referrals. It is appropriate for the executive office to forward relevant correspondence to the consular section, but it should not ask for special treatment of visa applicants or advocate on their behalf outside the referral system. Shortly before this inspection, the deputy principal officer told local staff to stop sending cases directly to the consular section. There are several issues regarding the way the referral system is handled at the consulate general. Not all referrals indicate how that referral directly supports U.S. national interests; they also do not specify the nature and degree of contact the person making the referral has had with the applicant, as is required by 9 FAM Appendix K.
The inspectors counseled the consul general and the deputy principal officer on the Department’s referral policy. They suggested having cards printed, explaining that visa eligibility is determined by strict legal requirements and that the consulate general’s leaders cannot influence the decision. This card, which could be given to anyone inquiring about visas, also could refer applicants to the consulate general’s Web site for additional information. The consul general accepted this suggestion. The mission’s referral policy is out-of-date. As stated above, the referral practices conflict with Department policy on what constitutes a legitimate referral. The consular officers at the consulate general have not been trained on the Department’s policy. Because compliance has been an issue, it will be important for the Ambassador to review a monthly report on all referral cases, including information on any email or other contacts that circumvent the policy. That includes everyone, including Chiefs of Missions and Consul Generals, no doubt. If there’s one thing that the State Department is really good at, it is writing and sending cables. So if these senior officers had to be counseled by the OIG on the Department’s worldwide referral policy what are we to think? That they don’t read their incoming cables? Or were folks aware of the referral policy but were too scared to rock the boat? We don’t know this for sure but we imagine that Vietnam as a communist country is considered a critical threat post for human intelligence. So, if those visa referrals did not indicate how each directly supports U.S. national interest, how come no one is asked to review all of them? The mission has a policy called “self clearing” that permits experienced, entry-level officers to send, without a manager’s review, memoranda requesting revocation of a petition. Given the sensitivity of these memoranda and the need for consistency, a manager should review all of them before they are sent to the National Visa Center for transmission to the Department of Homeland Security. Some officers indicated that managers spend little time on the visa line. The inspectors emphasized the importance of managers spending some time adjudicating on the line, both to understand any systemic problems and to regularly see the types of cases that officers encounter. Ugh! And where’s the lead by example and all that feel good stuff about holding self accountable and modeling the leadership tenets? This is the kind of thing that makes newbies get jaded rather quickly. “Lead by example” but what if they’re learning the bad example? FSI language training fail or who the heck talks nuclear proliferation with visa applicants? Consular officers also indicated the language training at the Foreign Service Institute did not help them conduct consular interviews; many were more comfortable talking about nuclear nonproliferation than about family relationships. The criteria for designating language study for a particular position (per 13 FAM 221 b. (l)) is that “only those positions where language proficiency is essential, rather than merely helpful or convenient, should be designated…” Language training, although useful, is expensive and time consuming. As such, it should provide officers with the particular language skills needed to adequately perform their job. Oh dear, like how difficult is this really – you ask, Bạn có bao nhiêu trẻ em? or Urani bao nhiêu bạn có trong căn nhà của bạn? You can just ask the visa applicant how many kids do you have or how much Uranium do you have in your house? Or what kind of heavy water do you use in your laundry? Or are you or anyone in your family ever employed by A.Q Khan? The possibilities are endless, so really there’s no need to have a consular-centric vocabulary to adequately perform a consular job. The consul general in Ho Chi Minh City circumvented host government importation restrictions by bringing in a vehicle that was more than 5 years old. There have been no reported repercussions. The stated reason behind the importation was to encourage the host government to relax this importation requirement, but the matter has not gained any momentum. It has not been followed up with a diplomatic note, nor was the issue raised with the Office of Foreign Missions. No other exceptions to the rule have been attempted, though some officers were encouraged to also import vehicles older than 5 years. And so there you have it …. and life goes on…. The names of the accountable, responsible principal officers are all in the OIG reports and a matter of public record. We hope to save our reading folks time from having to dig them up. FSTube Trends: Ambassador Video Cards from Washington, D.C. In the past, we have seen a smattering of ambassador video greetings usually posted on embassy websites, urging host country nationals to visit the website and check out embassy services. Like this welcome message by then U.S. Ambassador to Montenegro Roderick W. Moore, which is noisy and and could stand some improvement. In December 2010, then U.S. Ambassador-designate to Thailand Kristie Kenney sent a video message greeting the people of Thailand, while she was still in Washington, D.C.. The video is in English with Thai subtitle; approximately 16,000 views. On Dec 9, 2011, Ambassador Adrienne O’Neal also sent a video message to the people of Cape Verde prior to her arrival in the country, in Portuguese; some 385 views. According to a recent OIG report, before the Ambassador’s arrival in Hanoi, he recorded “a video of his preliminary thoughts and goals for his tenure in Hanoi, some of it in Vietnamese, for a television interview. An estimated 20 million viewers watched the interview. Another 6 million people viewed it after it was posted on the Internet.” We have not been able to find a video of that interview. In August 2011, Ambassador David Shear did have a video greeting for the people of Vietnam (some Vietnamese, English with subtitle) posted in the mission’s YouTube channel; it has 8,310 views. On Jan 12, 2012, US Embassy Moscow posted Ambassador Michael McFaul’s introduction video, in English with Russian subtitle; some 76,500 views. On April 3, 2012, the US Embassy Bridgetown and the Eastern Caribbean posted an video message from Ambassador Larry Palmer, who was confirmed by the Senate on March 30. Video in English, approximately 200 views. On April 16, 2012, the US Embassy in New Delhi followed with a video greeting from DC by Nancy Powell, Ambassador-Designate to India, also done prior to her arrival at post; 4,301 views. Last week, it was US Embassy Cambodia’s turn with a video on YouTube of Ambassador-Designate William Todd introducing himself to the Cambodian people; some 3200 views. This appears to be a video trend in the Foreign Service, no doubt created in Foggy Bottom. You can tell from looking at these videos that they have become more sophisticated. The sounds are better, the graphics are more snazzy, the editing more professionally done, etc. New shop at Foggy Bottom busy with these videos, huh? We do wonder what kind of views would be considered a satisfactory return of investment for the production of these videos? We’re not saying these intro videos are bad, we are simply pointing out that it cost staff hours (also known as manhours in govspeak) and money to produce and edit these videos. At what point are they considered successful – at 200 views, 500 views, a couple thousand views?